The University of Pennsylvania is hosting a Twitter chat from 2 to 3 p.m. (Eastern Standard Time), 1 to 2 p.m. (Central) and 11 a.m. to noon (Pacific) on Tuesday, April 19, 2016. 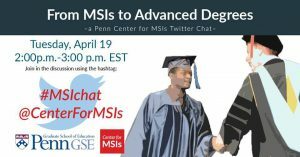 The chat, titled, “From MSI to Advanced Degrees” is to discuss how students can best prepare for graduate school. This chat is sponsored by Dr. Marybeth Gasman and the Center for Minority Serving Institutions and includes co-facilitators.